Winter is certainly upon us, but there are plenty of dogs at Orphans of the Storm® who are more than happy to romp around outside, even when it’s cold! 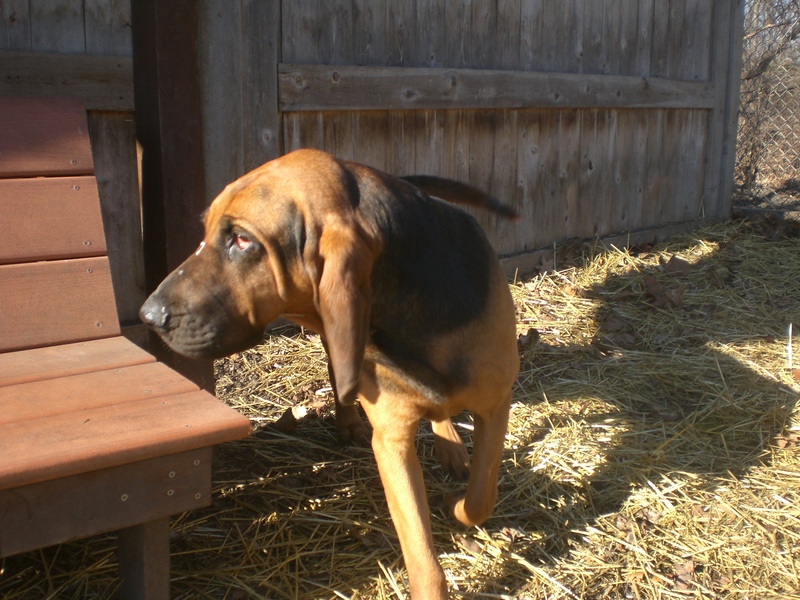 Flappy the five-year-old Bloodhound mix is just precious. I admit that I could not stop squee-ing the entire time I was with her because I love everything about her, and after I left the shelter I would talk about her to anyone who would listen. 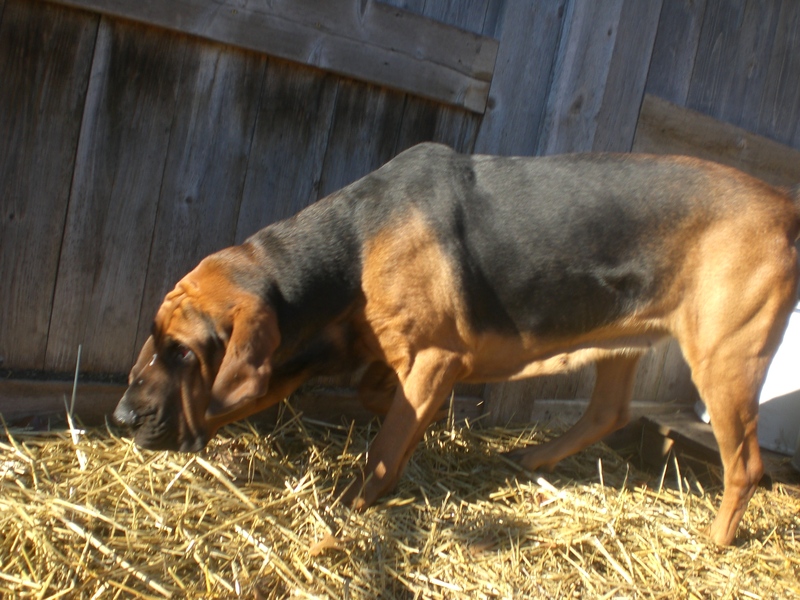 Flappy has that sweet Bloodhound look with the droopy eyes, floppy face, and flappy (of course) ears. She was a good walking buddy, though if her nose picks up a trail it’s pretty certain that she’ll follow it. Flappy is one of the few hounds I’ve met who loves to play fetch, and is very good at it! She was sniffing around the off-leash run and emerged from the bushes with a tennis ball in her mouth, which she promptly dropped at my feet. She loved running after the ball and always brought it right back to me. When we were done playing fetch, I knelt down next to her and she put her front paws in my lap and gave my nose a doggy kiss. 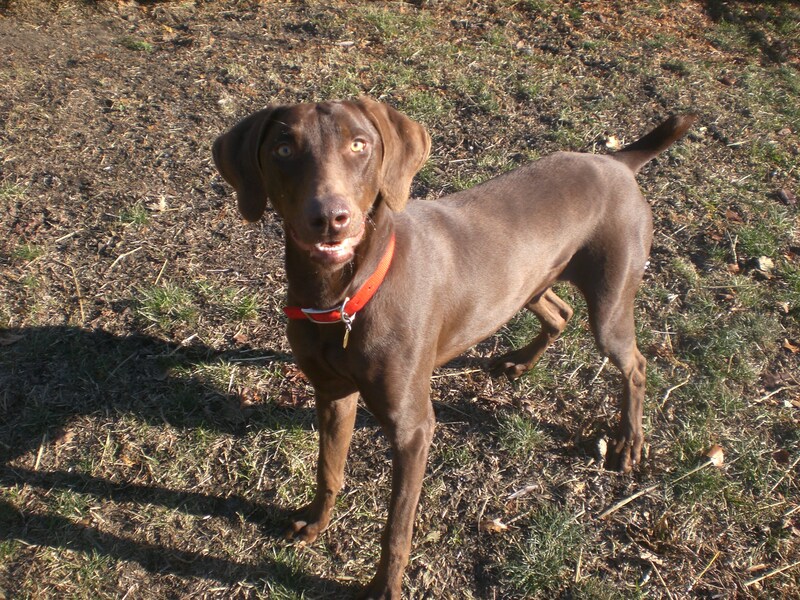 What a fun, sweet, good-natured dog! Stop by the shelter soon to meet Flappy. Mack the one-year-old Weimaranar/Doberman Pinscher mix (not to be confused with the other Mack) is still very much a puppy, although he is a big puppy. He is full of energy and thinks that everything is a game, which should make training him lots of fun! It seems that nobody has tried to teach Mack his doggy manners yet, so he does like to play tug-of-war with the leash and was nibbling on my gloves and jacket sleeves a bit–but who can blame him? Mack seemed to do pretty well with Sonny, who was on the other side of the fence, though his exuberance might be a bit much for some dogs. He understood the concept of chasing after a tennis ball, but hasn’t quite grasped that he has to bring it back in order for it to be thrown again. Mack did settle down eventually, where he very nicely sat next to me while I pet him, and gave me a few doggy kisses. Mack would be so happy to have a home of his own where he can go on daily walks and have daily playtime. If you’re looking for a big puppy to bring laughter to your life, come in soon to meet Mack! Frosty the eight-year-old Husky mix is probably the dog best suited for this type of weather. Not only does she have a warm, fluffy coat, but she’ll even blend in with the snow! Her eyes are such a pale blue that even they look white. Frosty was snoozing in her kennel when I came by, but she perked up and went outside as soon as she realized she was going for a walk. She did a great job on the leash as we made our way to the run. Frosty is, overall, a very sweet and gentle dog. Since she’s on the older side, she doesn’t seem like she needs as much exercise and activity as younger Husky mixes. She meandered around the run, sniffing here and there, stopping for a pat on the back when she’d pass me. As she got more used to me, she gave me a couple doggy kisses and enjoyed being scratched on the neck. Frosty isn’t asking for much–just a nice home for the holidays. Could that home be with you? On this frigid day, I also spent time with Molly (who greeted me with a big doggy hug), the other Molly (who covered my face in doggy kisses as I tried to put on her leash), Trixie (who loves tennis balls just as much as before), Akiva (who wants a yard of her own so she can romp in the snow to her heart’s content), Topaz (who happily joined me on the bench and kept a paw in my lap), and Lily (who didn’t show any signs of her initial shyness now that she knows me). The Holiday Pet Showcase is still going strong at Northbrook Court, all the way until Christmas Eve! Be sure to stop in and say hi to the adoptable dogs and cats while you finish up your holiday shopping. 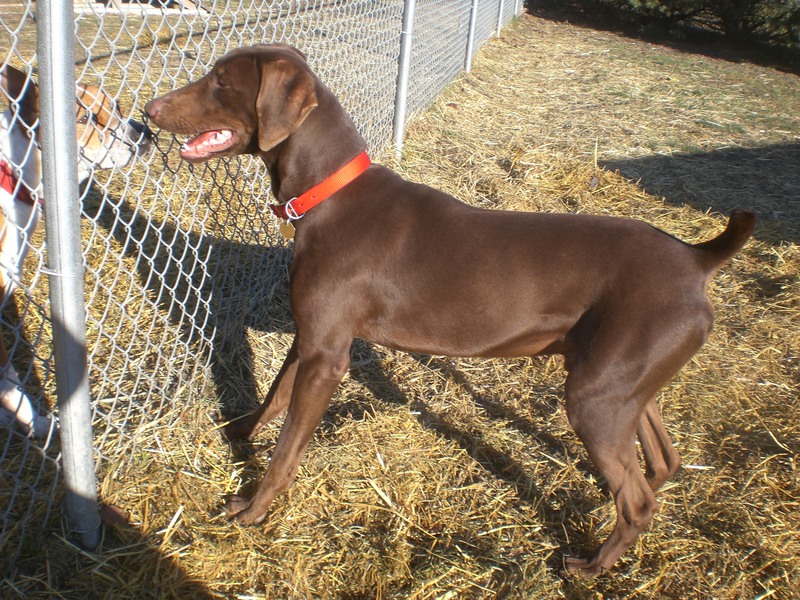 Posted by Meet the Pooches on December 12, 2013 in Dog Profiles and tagged adopt, adoption, animal shelter, animals, Bloodhound, Chicago, Doberman Pinscher, dogs, Husky, Orphans of the Storm, pets, Weimaraner.